My kale, feta and sweet potato pie is a fun experiment in gluten free cooking. It might not be perfect but the flavours are spot on! I’ll get straight to the point. I have been dealing with some family stuff in the last few weeks and it’s pretty much taken up most of my time. On top of that , I felt a little “burnt out” and needed to refocus on my creativity. I haven’t been cooking as much as I like to either. But that’s not so bad. I’ve been eating out and definitely had some great meals as inspiration. 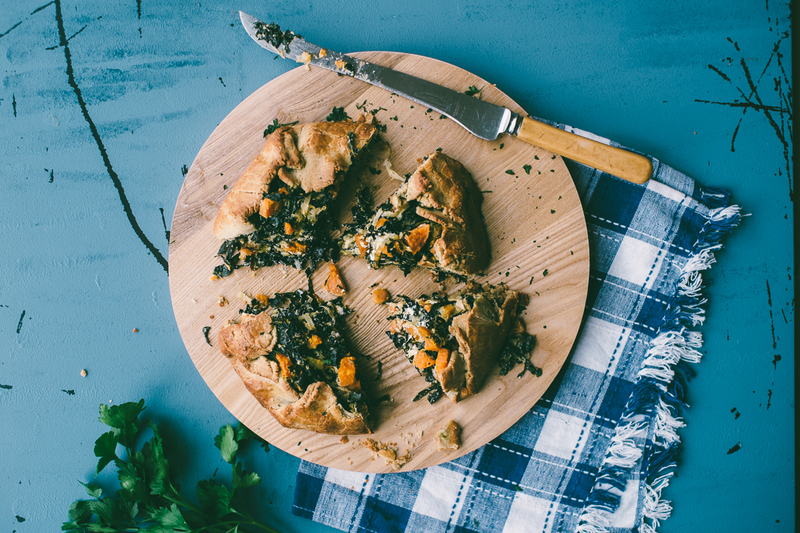 I think a kale, feta and sweet potato pie is a good way to get back into blogging. As usual I’ve been experimenting with gluten free doughs. Just to re emphasise, I’m not a coeliac or gluten intolerant. I just like cooking with different ingredients and really enjoy the challenge of playing with new things! I decided to step away from the spelt flour when making these pies and use a combination of buckwheat and quinoa flour. The smell was was kind of interesting and I think that had to so with the quinoa flour. The dough was OK but not the best. It was also very fragile and quite sticky and I think that had to do with the amount of butter I used. Still. I am not deterred. 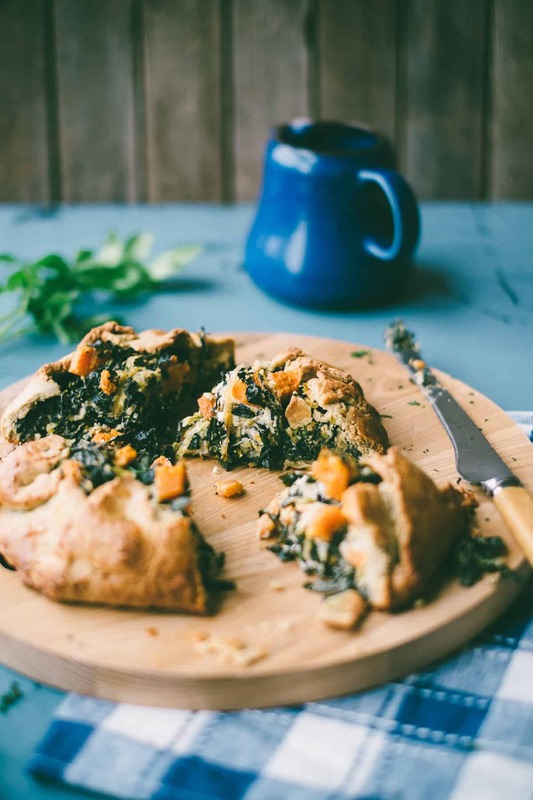 If you prefer you can make this kale, feta and sweet potato pie using my olive oil dough with spelt flour that I used to make the leek and cheese pie. Or you can use the original dough from my wild greens pie. The filling was inspired by autumn although if you live in Sydney at the moment you’ll probably be sun baking on Bondi Beach. It’s that ridiculously warm! Kale, sweet potato and feta are a perfect marriage and very filling. See you soon with some more cooking! A delicious gluten free and vegetarian pie made with kale, feta and sweet potato. Start off by making the pastry. Combine all the pastry ingredients in a food processor to form a smooth dough. Place the dough on a well floured surface and bring together. Wrap in cling film and allow to rest in the fridge for one hour. Place the sweet potato pieces in a pot of cold water and cook for 10 mins until slightly softened. Drain and set aside. Heat the olive oil and butter in a pan and sauté the leeks for a few minutes until softened. Toss through the shredded kale and stir until well combined. Add the cooked sweet potato pieces stir again and add the chopped parsley. Remove from the heat and allow to cool completely. Once cooled, stir through the crumbled feta. Preheat your oven to 180 deg C and line a large baking tray with baking paper. Remove the dough from the fridge and divide into two. Roll the pastry between 2 sheets of baking paper approx. 2cms thick. Scoop the kale mixture into the rolled pastry allowing for a few cms around the edges. Fold the edges over the mixture creating a rustic effect. Brush with egg wash (a little beaten egg with water) and cook for 30 mins until browned. Allow to cool for 10-15 mins before cutting and serving.